As one of today’s most renowned young photorealists, Chase’s attention to detail and elegant style have won for him a vast collector base. The Gapstow Bridge and the famous buildings beyond including The Plaza hotel, form one of the most romantic spots in the country. Warm lights contrast with the crisp cold of a winter night as they reflect in the dark waters beneath the stream, and the peace and serenity of Central Park contrast with the activity of a city beyond. Twilight in Central Park is the first in his new series, Reflections on America, which will focus on many of America’s treasured landmarks and famous landscapes. 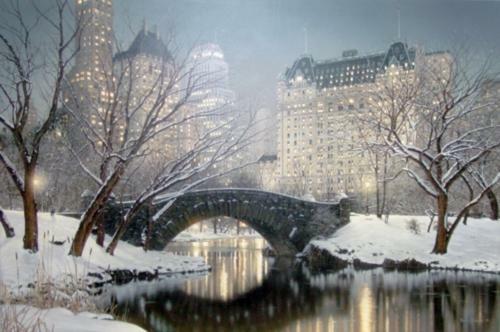 TWILIGHT IN CENTRAL PARK on Canvas 24" x 36"
Giclee on Canvas 30" x 45"